We’ve all been whining so much about the cold, we deserve a little slap in the face to wake us up. Of course, once we have our eyes open, we still won’t be able to see a thing because of all the ice fog. Driving in this morning was altogether surreal. Thanks again to Tim for saving our bacon. Not only did he drive me and Michael and our neighbour Joanne to our various destinations yesterday, but he went home and got Charmaine right after to take her to work. (Her and Norris’s car had both front tires go flat on the highway when they tried to drive in. Square wheels’ll do that, ya know.) Tim drove us all in to work this morning, too. I’m not sure whether it’s him or his truck who is more heroic, but I’m grateful to both. I have a similar thermometer, but mine only goes to -39.9 and after that it just reads “OFL.” I don’t know what that means, but I sort of accept that after -40 I am better off not knowing. You have a thermometer with an editorial bent, but I suppose it’s true that after -40, the temps could simply be described as “awful”. Hi Fawn – thanks for posting this picture. Hope you don’t mind but I shared it with some of my friends – as well as a link to your blog. I feel right at home…. Here in Stockholm people are wimps. They start complaining when temperature gets below -5 C. I grew up in the northern part of Sweden, close to the Arctic Circle, and winter there are fairly cold. We would regularly have -30 C weather and tons of snow. 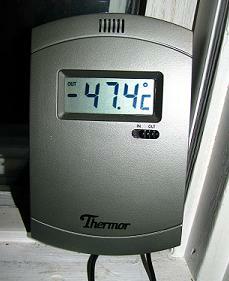 I can never remember colder than -37 C though.